Cover design is the visual appearance of the cover of your book. It helps to market your book and is an important factor in making your book stand out on the shelf, particularly on the virtual shelf where images are smaller and often viewed as thumbnails. 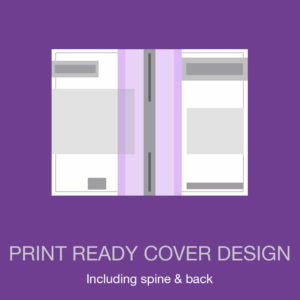 To help your book gain maximum attention, we offer Basic and Deluxe cover design packages, in addition to Print Ready Cover Design. Have a good understanding of the of your genre, the plot of your book, and the tone of your writing. How will you communicate the content and theme of your book. If you’re struggling, think about other cover designs you like and how you can make your cover design unique and visually attractive. Don’t worry – we can help you. Click here to view our graphic designer’s portfolio. 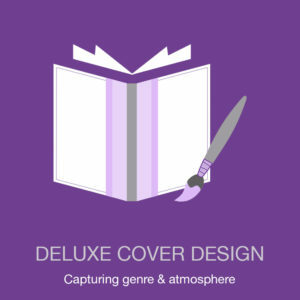 How does cover design work? We offer three different types of packages for cover design: Basic cover design, Deluxe cover design and Print ready cover design. We create custom designs for each client to meet their specifications. Our graphic designers will consult with you and put together a cover design in keeping with the theme and mood of your book, including title, author name, images and additional design elements to produce a professional finished product. Once we have everything, our designers can start designing your book cover design. Depending on what package you pick for the cover design, you will have a option of one or two revisions to the design. A ‘revision’ can include changes to the positioning of images, font/lettering, lettering position, tracking, kerning, colours and amendments to the style and/or intensity of special effects applied to text and/or images. Revision may differ depending on the package you purchase. Any additional revisions to the cover design will cost £25 per hour. Both cover design packages above include a standard copyright page and marketing copy ‘blurb’ as supplied by the author.